I’m a little homesick today. Living in the Berkshires, “the city” now means Manhattan, but my city will always be San Francisco. 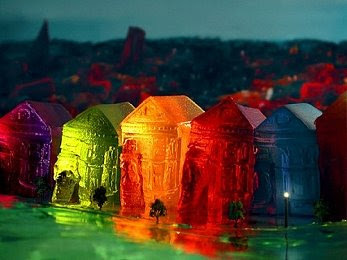 In homage, I offer you artist Liz Hickok’s inspired Jello renderings of the city by the bay. ← $10 Plane Tickets! Hello, Skybus. OK, that is awesome. I can’t think of many other cities that would work for as well as SF.